This black and white photograph shows baseball players T. J. 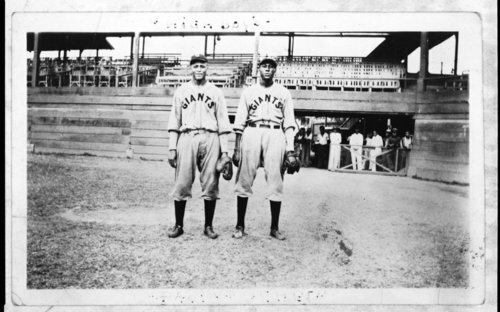 Young (left) and Chet Arthur Brewer wearing uniforms for the Giants baseball team. The men may have played for the Chicago American Giants or the Los Angeles Royal Giants. The term "Giants" is commonly used among teams that featured African Americans, Cubans, and other non-white teams.